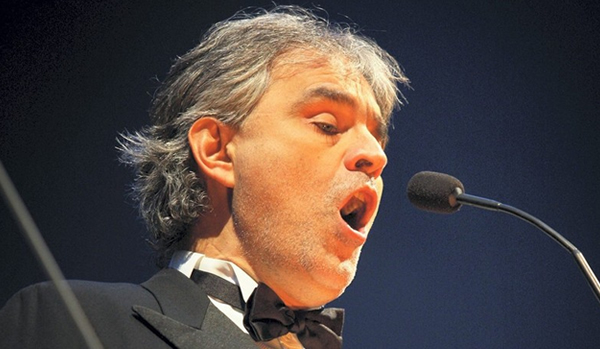 Andrea Bocelli has been called “the fourth tenor.” A disciple of Luciano Pavarotti and Zucchero Fornaciari, the blind, Tuscany-born vocalist emerged as one of the most exciting voices in contemporary opera. His participation in Pavarotti’s1992 hit “Miserere” and Fornaciari’s 1993 world tour brought him international attention. Opera, however, represents only one side of his musical persona. Bocelli grew up on a farm in Lajatico, a rural village in Tuscany. Beginning piano lessons at the age of six, he later added flute and saxophone. Born with poor eyesight, he became totally blind at the age of 12 following a soccer accident. Despite his obvious musical talents, Bocelli didn’t consider a career in music until he had studied law at the University of Pisa and had earned a law doctorate. Inspired to pursue music, he studied with famed tenor Franco Corelli, supporting himself by performing in piano bars. After touring with Fornaciari in 1993, Bocelli performed as a guest star in the Pavarotti International Festival held in Modena in 1994. Bocelli’s first two albums — Andrea Bocelli in 1994 and Bocelli in 1996 — showcased his operatic singing. His third effort, Viaggio Italiano, featured famous arias and traditional songs from Naples. Although released only in Italy, the album sold more than 300,000 copies. With his fourth album, Romanza, released in 1997, Bocelli turned to pop music. He continued to focus on pop balladry with his fifth. album, Sogno, released in 1999, which featured a Carole Bayer Sager-penned tune “The Prayer,” and sold more than ten million copies, received a Golden Globe Award, and led to Bocelli being nominated for a Grammy as Best New Artist.